At Ad Lightning, we consider ourselves lucky. We get to work with a wide variety of industry thought-leaders every day across a wide range of digital publishers and solution providers. Many wrestle with common issues, but each has a unique perspective. At the beginning of 2018, we surveyed over 100 Ad Ops leaders to get a sense of their outlook for the coming year. There were many interesting learnings gleaned from that study, including the depressing revelation that 63% of publishers feel that ad quality issues haven‘t improved or have gotten even worse over the last 12 months, but that 75% believe publisher-side ad blockers like Ad Lightning will have the most positive impact on ad quality. Recently, I followed up with a number of industry experts and asked if they’d share a few mid-year perspectives on the 2018 digital ad landscape —any surprises, challenges or major decisions they wanted to discuss. I’m happy to report that quality and transparency remain at the forefront of the conversation well into 2018. Our publisher partners continue to push for solutions that give them better control over their tech stack and audience. The new Open RTB spec is a good example of how accountability and improved tracking through the ecosystem is still at the forefront of the conversation. Many thanks to our friends at Bustle (Kai Hsing), Rubicon Project (John Clyman) and Univision (Tyla Mayo) for sharing some of their latest perspectives below. What’s surprised you the most about the digital advertising/publishing landscape so far in 2018? Scott Moore, CEO, Ad Lightning: John makes a great point. It’s always a positive thing when the industry can come together quickly to collaborate over the latest challenges to ad quality. Scott Moore: Kai’s point is spot on, unfortunately. As we continue to track the proliferation of mobile redirects and various methods of video fraud, the rate at which new fraudsters are entering the ecosystem surprises even us. Data from this past year continues to show huge spikes in fraud, particularly at the end of the week, month and fiscal quarters. These bad actors are savvy enough to know when to flood the market with bad ads. What’s your biggest ad quality challenge going forward this year? When it comes to redirects, our goal at Ad Lightning is to stay ahead of the fraudsters. We’re continuously working to anticipate and detect the tactics bad actors use to inject unwanted behaviors into ads. Scott Moore: Tyla’s frustration with video ad quality is understandable. It’s still a big challenge and the market continues to grow at a rapid pace. The infrastructure to deploy video, especially programmatically, is still very fragmented. There are few one-size-fits-all solutions for video —and that drives up costs. She might be happy to know that Ad Lightning’s roadmap for Q3 and Q4 is heavily dedicated to innovative video quality tools. Tyla Mayo, Univision Communications, Inc.: “We began a major initiative in Q4 of last year to redesign and optimize our site for mobile and viewable ad positions. As part of this effort we removed the header ad and placed the first display ad amongst compelling content, abandoning the concept of a must-have above the fold placement. Our hypothesis was that ads at top of the page are immediately scrolled out of view and misses the point of being viewable. We were right. After making the change, the in-view score for our 320x50 has more than tripled since last year. It was a tough sell, but it’s clear we made the right decision." Scott Moore: Digital advertising never stops evolving. It’s incredibly rewarding to be able to help the industry move forward and stay ahead of new challenges and threats as they emerge. John, Kai and Tyla, thank you for sharing your perspectives! Over the last several weeks, Ad Monsters has been publishing a series of articles about the state and future of ad quality. It’s an insightful read for publishers and sell-side solution-providers. In the story’s first installment, titled “Three Pillars of Ad Quality: Beyond Redirects”, the author, Brian LaRue, delves into a gamut of quality issues and suggests ways in which publishers might holistically address both the redirect crisis and the other ad quality threats they’re facing. Redirects are so disruptive and pervasive, it’s easy to get overly focused on that single issue and wind up patching that and each additional problem with a separate point solution as each reaches a point of disruption. Ultimately, it’s best for publishers to consider all of the ad quality issues they’re facing and seek solutions that address the spectrum of threats together as a single category, which leads us to the second installment in the series. There are several other creative compliance problems that are just as significant but tend to grab fewer headlines than redirects and malware. The second article in the Ad Monsters series takes a closer look at quality compliance beyond redirects and highlights concerns that 28% of programmatic ads are out of compliance with IAB ad quality specifications. Although the IAB has established very specific guidelines, these five issues continue to threaten publisher brands and revenues at alarming rates. The size of standard banner ad files should be 200KB or less, according to the IAB, but 41% of ads exceed that size restriction. Some ads are as large as 30 MBs. The ad delivery and decisioning process adds numerous trackers to each programmatic ad. The higher the number of network requests and tracking scripts, the longer it takes for the ad unit (and surrounding content) to load. The IAB suggests a maximum of 15 network calls for any given ad unit. On average, ads are now burdened with more than 50. Page delays also occur when an ad demands an unusually high amount of processing power on the user’s CPU in order to properly render. The acceptable processing max is 300 milliseconds, but more than 30% of ads are overly processor-intensive. In order to meet HTTP/2 – compliance, all components of display ads, including the creative and the trackers, must be SSL compliant in order to appear on those sites. The IAB recommends HTTP/2 adoption as a best practice across the board, but more than half of the network trackers that pile onto programmatic ads aren’t SSL compliant. Programmatic ad delivery significantly increases the occurrence of ads in unsupported (or undesired) formats, like Flash and auto-play video. These formats create conflicts when they render and further chip away at the user experience. As the primary digital touch point with consumers, publishers shoulder the burden of addressing ad quality issues. It's become essential for publishers to use tools that reveal the specific quality threats. Here's an example of how an innocent looking ad contains multiple infractions. The frequency of ad quality issues is alarming and the problem continues to grow as programmatic becomes more entrenched as the standard approach to transacting and delivering digital advertising. In fact, most of the quality issues are an unintended consequence of the programmatic process. Ads typically begin their journey with a short list of standard ad requests and tracking tags that are intended to measure basic impressions, clicks and viewability. The ad may also start with a compliance issue, like improper formatting. From there, however, issues become progressively more offensive. When a user loads a web page in their browser and the call goes out to find the best ad to deliver to that user at that moment, each of the players involved (like SSPs, Ad Exchanges and Networks) adds additional, weighty, trackers and sync requests to the ad as they attempt to match it to the user. In the split second journey from request to delivery, ads can pick up dozens of additional trackers. With its LEAN initiative, the IAB is making an effort to get both advertisers and publishers on board with quality standards that will protect and improve user experience. So far, their efforts aren’t enough. The second Ad Monsters article makes several key points along these lines. Today publishers bear the full burden of addressing bad ads. 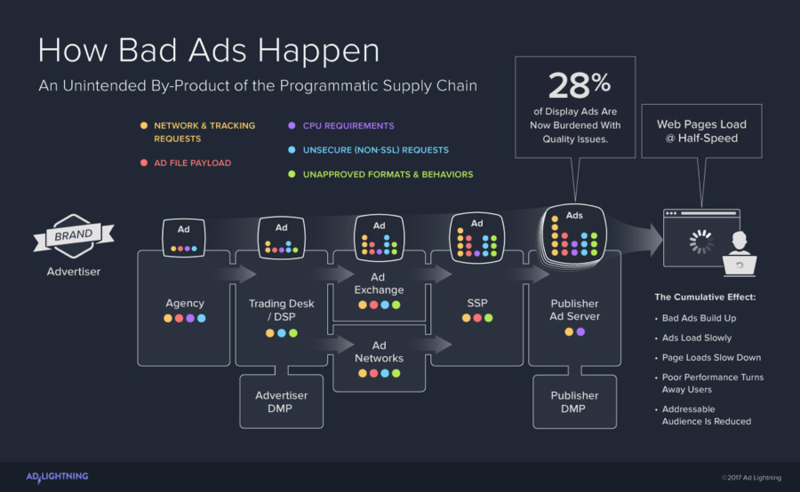 In order to make real progress in our programmatically-driven industry, the full range of programmatic players must comply as well. Demand partners need to step up with pre-flight testing, staying updated on threats, and addressing bad ads before they make it further down the pipes. That’s a serious uphill climb. Cleaning up the buy side’s messes shouldn’t be publishers’ responsibility, but as the number one touch-point with users, publishers are forced to pick up the slack. In 2018, that means turning to publisher-side ad blocking solutions. The ideal ad blocking solutions are those that help publishers deal with ad quality issues holistically by incorporating multiple strategies for quality assurance into one unified solution. The best publisher-side ad blockers work proactively. They know about the bad ads and current attacks across the ad ecosystem at that moment and provide real-time insights to exchanges and ad platforms. The third and final installment of the Ad Monsters series on “The Three Pillars of Ad Quality” is due out later this week. Ad Fraud is at an All Time High: Distance Your Site From One of the World’s Most Profitable Criminal Enterprises. Despite contrary claims from the ad industry, instances of ad fraud haven’t diminished. In fact, according to ad fraud researcher and technical forensics expert Dr. Augustine Fou, fraudulent ad schemes have reached an all time high in both the dollars at stake and the rate of occurrences. In Dr. Fou’s recently published presentation “The State of Ad Fraud Q2 2018”, he outlines numerous examples of fraudulent practices that continue to generate billions of dollars for bad actors. Several of the angles he cites have a direct impact on publishers, including issues like malvertising, redirects, tracker security loopholes, sandboxing iframes, ad stacking and others. Here’s some good news. Just about every publisher issue outlined by Dr. Fou is now addressable by applying new publisher-side technologies that execute two critical processes in tandem with each other: 1) They rigorously scan ads for a variety of potential problems, and 2) They automatically block ads that don’t meet specific standards and requirements. Dr. Fou points out in his report that redirect ads (aka: “pop-ups”, “auto-nav”, “forced view”, etc.) are out of control with an estimated number of occurrences exceeding 100 billion per month. Auto-redirect schemes continue to target large publishers and are now costing advertisers (and publishers) over a billion dollars annually. Our own tracking data shows a continual increase in the occurrences of redirects, as well. Ad stacking is another example where fraudsters find ways to stack multiple ads within a single placement, with each ad in the stack counting as an impression whether it’s ever seen or not. To compound this issue, the bad guys have also gotten clever about ensuring that ads report as 100% viewable by stacking ads in placements above the fold. Earlier this year, our scanning technology picked up similar, previously-undetected ad stacking scams that were actually enabled by header bidding. Once a scheme like this is identified, publishers can use advanced ad blocking tools to block the ads and related sources according to the publisher-defined ad blocking rules. Dr. Fou’s report is a good reminder. While you don’t see it all every day, there’s a lot of ugly fraud out there. And, it seems to be getting uglier. New publisher-side ad blocking solutions are helping publishers distance themselves from the growing, messy tangle of digital fraud. If you’d like to learn more about combatting fraud with publisher-side ad blocking technologies, please drop us a note. We’d be happy to help.